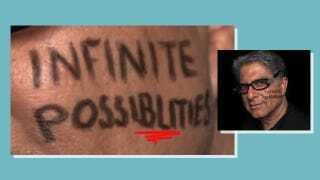 Deepak Chopra, online werewolf and mortal nemesis of Gizmodo's Matt Novak, wants you to know the possiblities are infinite. A message he decided to share with the world using the only medium that matters anymore—his Twitter avatar. The possibilities are so infinite, in fact, that he has freed himself from the shackles of spelling. B freee!